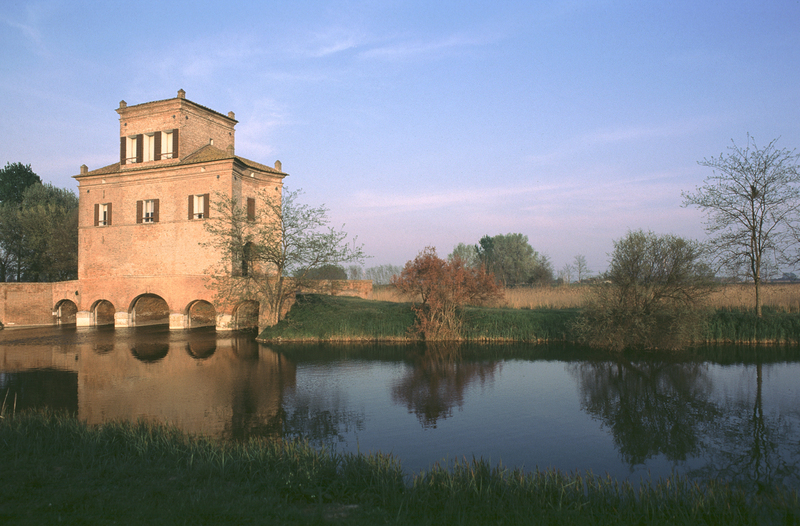 Torre dell’Abate is a composite building: it was built as a sluice gate in the second half of the sixteenth century, as part of the huge land reclamation project undertaken by Alfonso II d’Este, and was soon incorporated into the perimeter wall that encloses the Mesola estate, a freehold property totally owned by the Duke. The sluice has five barrel vaulted basins and five mitre gates which receive the waters of the drainage canals and prevent the backward flow of seawater. Its hydraulic efficiency was short-lived as the area was soon buried by the sudden progress of the advancing coastline following the diversion of the river Po at Porto Viro (1599). The upper part, built in the seventeenth century, consists of a main building with an entrance hall with the side walls curving inwards, crowned by a lookout tower for territory control. Torre Abate is State property, whereas the seven hectares of surrounding land belong to the Municipality of Mesola, and were artificially re-flooded in the 1980’s in order to recreate the natural landscape of the sluice gate.